The batto chair is an all wood chair that can be used as a dining, task or side chair. It was originally designed with our thai table in mind but it is simple enough to partner with other tables as well. 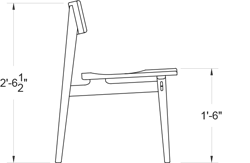 The chair is assembled using only joined elements, there are no screws or bolts. Features include: shaped seat & back, mortise & wedged through tenons and sliding dovetails.